We werken met de nieuwste opname- en bewerkingssoftware en verzorgen daarmee de complete bewerking, mixing en mastering van je productie. 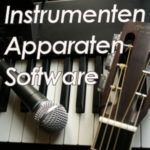 In onze studio staan diverse instrumenten, apparatuur en software tot je beschikking, en natuurlijk ook professionele microfoons (o.a. Neumann, AKG, Shure, Sennheiser). Piano VST plugin: Ivory concert-piano (by Synthogy) incl. Steinway, Bösendorfer, Yamaha. We also have a great (VST) variety of synth sounds! recording-microphones: Neumann, AKG, Shure etc. various small (hand) rhythm-instruments: woodclaves, maracas, bongo’s, pandero, shakers, cabasa, rainmakers, tambourines etc. 2x KM-84i (small diaphragm cardioid condensor). 1x MD402-K (super directional dynamic). 4x SM-57 (unidirectional cardioid dynamic). 2x C1 (large diaphragm, fixed-cardioid condenser). 1x MXL 2006 (large diaphragm cardioid polar). 1x SCM1000 (large diaphragm condensator). 2x Audio Technica AT9000 (electret condensator), 1x Grundig GDM12 (1958, dynamic), 2x UHER M136 (1968, dynamic), 1x Samson QKICKCL (dynamic kick/bass/drum microphone), 1x Soundking E08D (set of 8 low-end drum-microphones :-), 1x Samsom 5Kit dynamic drum-microphones and a small but steady growing collection of several (low-end) ‘oldies’ microphones. 4x AcerP235H 22 inch TFT displays (one of them for monitoring in the recording-room). Dell Dimension 9150, Miditower 400W, Intel Pentium i3 processor, 4 Gb RAM, Windows 7 (32 bit), AcerP235H 22 inch TFT display. Apple Macmini 8, OSX 10, Intel Core 2 Duo processor, 6 Gb RAM, AcerP235H 22 inch TFT display. Laptops: Lenovo Thinkpad, Lenovo G70, Acer AMD.